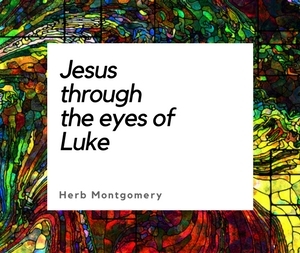 Last week we considered Jesus’ narrative of enough for everyone, sharing, generosity, peace-making, distributive justice, and cooperation to replace our tired narratives of scarcity, competition, accumulation, monopoly, violence, and hoarding. This week we see this theme in some of Jesus’ most pointed teachings on resource sharing and mutual aid. Let’s try and taking this passage section by section. To serve God means to take responsibility for the care of others. Doing that cuts into profits: you can’t place people and profit as both your highest priority. Endlessly pursuing capital leads to wage exploitation, environmental abuse, and violence to protect one’s accumulation or gain more at the cost of dehumanizing other people. How many injustices toward humanity such as patriarchy, slavery, racism, colonialism, anti-Semitism, or Islamophobia are based on building more capital over care for people? We are part of one another. The service of ever pursuing the gain of money as the highest priority leads us to sever our connectedness to the humanity of others and ourselves as we sink into the quick sand of individualistic concern for only oneself and your own survival. Worrying that there is not enough for everyone can lead us to try to solve the dilemmas of survival and thriving for ourselves at the expense of others. Jesus addresses this “worry” head on. It really is a matter of trust. Do we trust that another world is possible? Do we trust that if we truly choose people over a never-satisfied, never-satisfying accumulation that there will be enough for everyone in the end? I’m growing more and more convinced that for many who suffer from a drive to accumulate that is never satisfied, that drive is based on a deep-seated fear that at some point in the future they will go without. That fear has answers. One is to abandon others and ensure that you will never go without. Another is to invest in people, in a community where we take care of one another and where, no matter what happens, whatever the future holds, whatever comes our way, we as a community are in each other’s corner. Those who have more than they need share with those who don’t, and that creates a community where because giving is part of their values, they will also receive if they’re ever in need..
Jesus is asking his audience to value people in this kind of community over their worries of what to eat, drink, or wear. That’s not because Jesus wants anyone to go hungry or naked, but because he calls his followers to the path of sharing responsibility for making sure that no one is hungry and/or naked and that everyone has enough to eat, drink, and wear. Jesus then brings up birds and flowers. It’s true that birds don’t sow or reap; they are hunter-gatherers. Yet Jesus also uses the phrase, “store away in barns.” When a farmer in Jesus’ society reaped more than they needed, they built bigger and bigger barns (see Luke 12:18). Jesus is instead asking his followers to share their surplus if they have more than they need between now and the next harvest. Share your harvest with those whose harvest was not enough. Don’t build bigger barns. Share with those who need the extra that you were blessed with. In this section, Jesus is digging into his own Jewish roots for the manna story of the Exodus. (Read Exodus 16.) Those who gathered much manna shared with those who had gathered little and there was enough for everyone. There was no need to hoard for tomorrow; there would be more tomorrow, and today’s hoarded manna would be worm-ridden and rotten by tomorrow. Every day provided enough, just as each day the birds had enough. 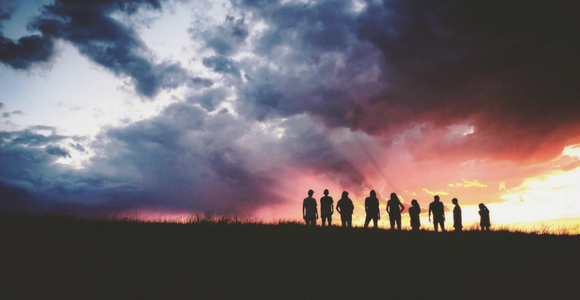 Each time a community of people desires to live out the reign of God and practice distributive justice in our world today, we see Jesus’ vision of the kingdom of God. A kingdom is a region where the will of a sovereign is done. 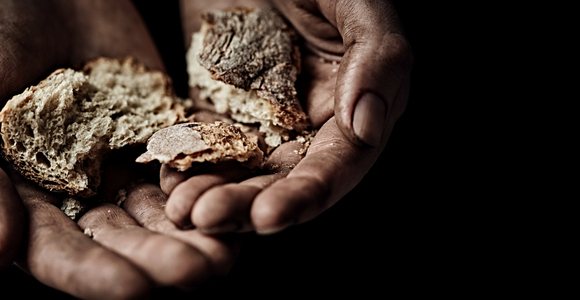 Jesus borrows “kingdom” language to illustrate his God’s desire for everyone to have enough, enough bread for today, and no debts for tomorrow. Jesus isn’t giving a magic formula. He’s not saying that if we work toward this kind of world then all that we need will simply fall out of the sky. No, it’s more cause and effect. When we seek the kind of world rooted in mutual aid and care that Jesus labeled “the kingdom” we are creating community where each person takes responsibility for ensuring that we all, together, have enough to drink, eat, and wear. Jesus tells us to choose to create a world of mutual aid and care. When we do, “all these things” that we are so worried about today “will be given to us as well” because we’ll be giving them to each other. We have each other’s back. Ours will be a community where we take care of one another. This last sentence really hits the nail on the head. What keeps us from sharing today is worry about what we will do tomorrow if we need what we’ve given away today. Jesus asks us to let go and trust in kinship. Trust in our connectedness. Trust that in being someone who cares for others, we are awakening in others the willingness and generosity to care for others too. Be the person God is sending into someone’s life today to care for them and don’t worry about tomorrow. Focus on building the kind of community where mutual aid is deeply valued. And then let tomorrow worry about itself knowing that if trouble should come, we belong to a community that is much larger than its parts. This is a community that takes care of its own (and maybe even those, too, who don’t yet belong). Reach out and care for the needs of those before us today. Generosity and sharing awaken generosity and sharing such that tomorrow, should you need it, someone will be there to generously share with you, too. Again, Jesus addresses our worry or “fear” of the future with the words “don’t be afraid.” It’s God’s pleasure to work through us and give us the kind of world where we, rather than competing with one another, have learned to cooperate with and take care of one another. So with this assurance, sell your hoarded possessions and give to those the present system has left in poverty. Set in motion a new social and economic order where there truly is enough for everyone to thrive. In doing this, giving to those presently without, we are “providing purses that will never wear out.” We can keep our money pouches to ourselves in hope we’ll have enough for whatever comes our way in the future, or we can invest in people and a world where our money pouches are open to others and each person willingly opens their money pouch to us when we are in need. There truly is enough for everyone when we choose to share what little we may have with our human siblings. This community is a treasure “in heaven” that will not fail and that no thief or moth can destroy. But why “in heaven?” I don’t need a community in heaven, I need that community here, now, on earth. Right now, my daughter is away at college. Most of her most prized possessions are being kept in our attic, safe for when she needs them. But when she needs them, she won’t have go up to the attic and stay there to enjoy them. These things being kept safe in our attic will be brought down and she’ll be able to enjoy them with us. God wants to give us this kind of world here, now today. Another world is possible. And when we invest in this kind of world, we are investing in a community the vision of which is being kept safe “in heaven,” until such a community of people can be realized here “on earth” (see Matthew 6:10). In this world, we have to make a choice. Will it be people or the endless accumulation of money? We can’t do both. But we can have a world where we and those around us have enough to thrive. It won’t be through individualist monetary accumulation. It will be through seeking a world of mutual aid, love, service and care for our fellow humans. 1. This week discuss some of the ways you, as a community, can take care of the needs within our group. 2. How can your group help those not part of your HeartGroup. 3. Pick something from the above two discussions this week, and put it into practice between now and the next time you come together. Wherever you are, keep living in love, survival, resistance, liberation, reparation, and transformation, working toward a world that is a safe, just, and compassionate home for all. I’ll see you next week with part 3.